It’s a beet panzanella. And it’s now officially one of my new favorite reasons to love summertime. They officially sold me with the basil. You could throw fresh basil on just about anything and I’d at least try it. And when, as a bonus, somebody mentioned that the original impetus for the dish was a Martha Stewart recipe…I figured it couldn’t be ALL bad, right? For P.’s part…well, okay, he’s in full-on veggie aversion mode, but he’s 2. It’ll pass. And he eats beets if I make them into chips, so I suppose you could say he DOES in fact like them. The fact remains, though, that a main dish centering on beets seemed like a good enough way to make a light vegetarian supper that wouldn’t engender too many complaints from the family. Since I didn’t want to fool too mightily with the original, beautifully simple concept, I decided to make a panzanella; not only would the cubes of bread be non-competitive with the vegetables in their flavor, but in my experience, if you want kids to be excited about eating a new vegetarian dish, bread never hurts. For our parts, J. and I were thrilled with the outcome of the salad — though I think the addition of a bit of goat cheese atop our portions didn’t hurt J.’s opinion of things. Three bites or so into dinner, J. said with a tone of some surprise, “This is really tasty.” He was right. It was really tasty. And easy. And on an 85-degree evening, a little panzanella and fruit is never the wrong answer for dinner. Once the beets are cooked and cooled, the skins should slip right off. Peel the beets and slice them thinly; if they’re large, cut the slices in half. Set the sliced beets aside. To make the croutons, preheat the oven to 400 degrees. On a baking sheet, toss the bread cubes with a drizzle of olive oil, some salt, and pepper. Bake them in the oven for 15 minutes, or until just golden brown. While the croutons are toasting, make the vinaigrette. In a blender (or with an immersion blender, if you prefer), combine the garlic, lemon juice, honey, and some salt and pepper. With the blender running, stream in the olive oil until the mixture is smooth and emulsified. You may need slightly more or slightly less oil for your tastes, so stop and taste the dressing at least once during the process to adjust as needed. 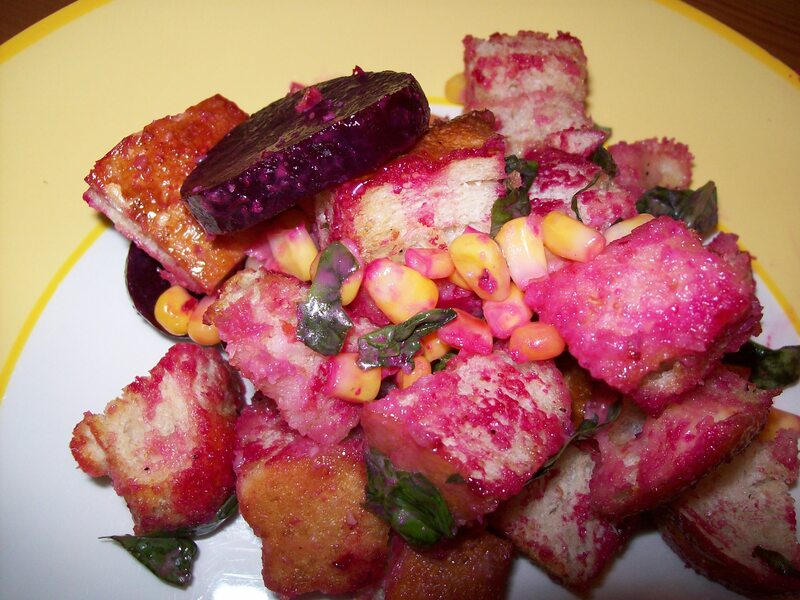 Combine the warm bread cubes, beets, corn, and basil in a large bowl. Pour 1/2 of the dressing over the salad and toss to coat. Depending on the density and texture of your bread, you may need more dressing. Taste and add more dressing as needed. (I used about 2/3 of what was made.) Serve the salad immediately, topped with crumbled goat cheese if desired. This entry was posted in Cooking, Feeding kids, Meal planning, Parenting and tagged cooking, family, Farmer's Markets, feeding kids, food, Household organization, kids' health, leftovers, lunchboxes, meal planning, parenting, recipes, veggies. Bookmark the permalink. Hi! I haven’t commented in a while, but I’m still reading and enjoying!! I don’t like beets, but even I might try this recipe! Thanks! It is TOTALLY normal. In fact, it’s more than normal. It’s like a rite of passage! I think I’ll do a roundup sometime soon of all the weird food stages little ones go through and what’s of concern and what’s not, because it’s SO anxiety-producing for parents to have to just sit there and watch it progress. Stay tuned!